After 15 years in Vermont, my husband, Carlton, and I are moving to Colorado this fall, just in time for Thanksgiving. (And yes, we’ve decided to take the children — Dillon, 10, and Harper, 9 — with us.) On a recent Saturday evening, moving boxes strewn about the house, we realized that we had one more chance for a daylong family adventure in the Green Mountain State. Would we ride the Burlington bike path? Canoe Lake Champlain? Hike Camel’s Hump? It had to be outdoors, we told the kids, and we all put our ideas in a hat at the dinner table. Tada! Trapp Family Lodge was the winner. We’d go mountain biking, Carlton told the kids, then eat lunch at the new Bierhall. Sunday morning dawned bright and balmy, and our spirits were high as we drove to Trapps’, stopping at Cold Hollow Cider Mill for a paper sack of donuts, then winding up through the hamlet of Moscow to the Tyrolean property. We bought a family trail pass for $30 and wheeled along Sugar Road into the kaleidoscope of trees, stopping for a photo op. As I, the caboose, tucked my phone back into my pocket, Harper stopped suddenly in the middle of the trail, triggering me to hit my front brake in panic and then head hiney-over-teakeattle across the handlebars. Shaken, I scanned my body. Nothing broken, but a scrape on my right knee and a couple of bumps. Humbled, I resolved to focus only on the mountain biking and not the potential Instagramming. 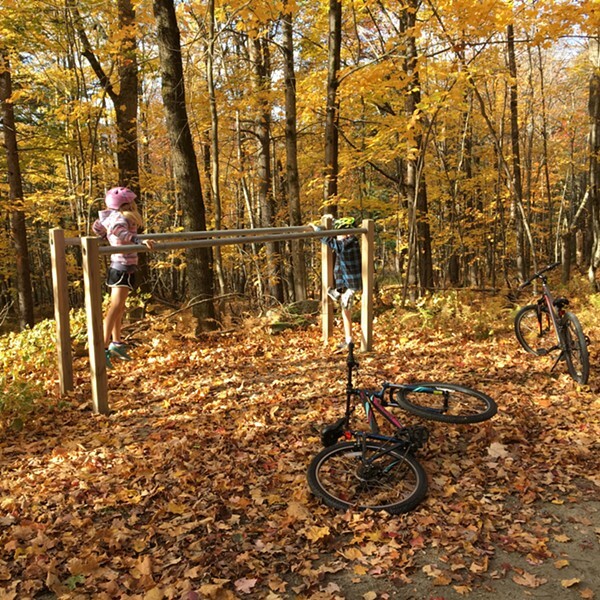 We had one more distraction — the kids playing on a set of parallel bars in the woods — before we were rolling again. Carlton had decided we would go all the way to Slayton Pasture Cabin, with the promise of donuts when we arrived. We wheeled through the trees happily, listening to the crunch of leaves, until the sounds turned to whining. And more whining, as Dillon’s legs grew tired on the uphill parts. Harper joined in, as did I, internally, as we began walking our steeds up the steep hills. A sign told us we had 1.5 kilometers to go. We pressed on, and I reached the cabin first, watching the sparrows in silence until Harper showed up, followed by Dillon and Carlton. We gobbled up the cider donuts contentedly, then biked back down toward the Bierhall, where we'd fuel up with burgers, bratwurst and Brussels sprouts. But first, there were the delights of the Trapp trails on a quiet Sunday — the hushed secret cemetery, the handful of hikers lost momentarily, and the magic of cementing this day in our memories after 15 remarkable years in Vermont. Mountain biking trails at Trapp Family Lodge close in early November, but the property offers snowshoeing and cross-country skiing in the winter. Visit trappfamily.com for more information.